One year on from King Bhumibol’s death his cremation will take place on Thursday this week; 26th October. This is the BBC’s video report on the year long construction of the funeral pyre in Bangkok. Starting with Jonathan Head’s report for BBC World immediately after receiving confirmation of King Bhumibol’s death. The broadcast started just before 6pm in Bangkok. Profile: Thailand’s new King Vajiralongkorn BBCThai (censored in Thailand). “Just a formality”: Thailand’s peculiar interregnum New Mandala (do read the comments as well). 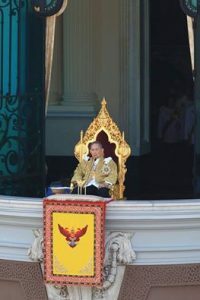 The Future of the Monarchy in Thailand David Streckfuss in The Kyoto Review in 2013 (and now very relevant).